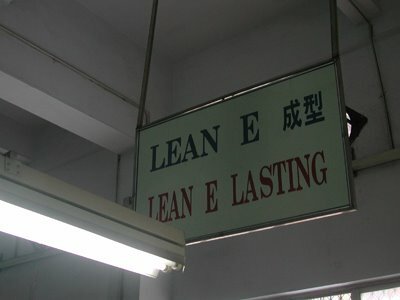 One of the most important steps in footwear production, is lasting. 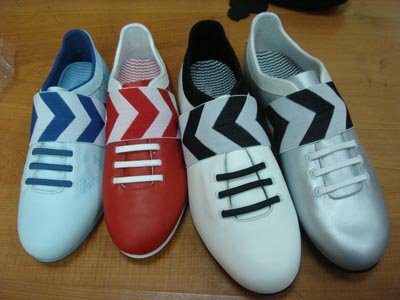 This process gives a shoe its shape, and as mentioned before, the last is key in good fit and comfort. This is even more important in a football boot where touch and fit and very important to performance. More info and pics after the Read More link below. The lasting process comes after the full upper is stiched together. 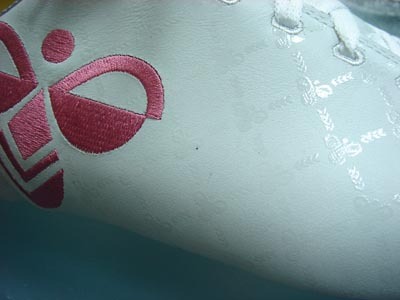 At this point, the upper is prelaced before lasting. For the majority of football boots, the lasting process used is a type called "board" or "cement" lasting. This type of lasting gives a football boot more stiffness and better feel. 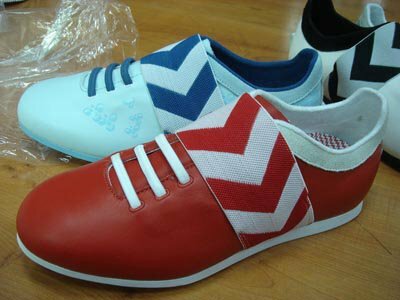 Other types of lasting (mostly used for running type shoes) include strobel (slip) lasting and california lasting. For board lasting, a cardboard type tuck board is placed at the bottom of the last that the upper will be cemented to. 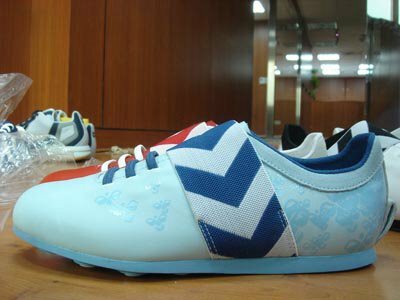 If you lift up the sockliner liner of a football boot or other type of boot made this way, you will see this board. For board lasting, the upper is placed over the last with the cardboard insole board temporarily glued to the bottom of the last, and into a lasting machine. You can see the workers adding glue to the inside of the the upper and to the cardboard insole (laying over the upper on the conveyor) in the above pic. A toe lasting machine has grips that grip the edge of the upper in the toe around the bottom of the last and pull it down over the last shape. One set up with the grips attached to the upper material, the lasting machine operator adjusts the tension of the pull and lines up the upper on the last using a laser guide. When the operator has achieved the correct alignment and pull strength, the upper is stretched over the last and "wipers" force the upper material under the last over the cardboard part. 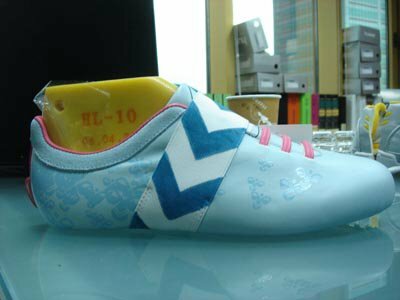 In addition sometimes injected TPU type glue is used for football shoes that is directly injected between the upper and insole board during the lasting process. 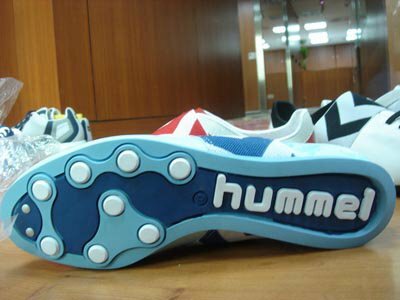 This is important for football shoes that have a lot of wear and tear in the toe area. 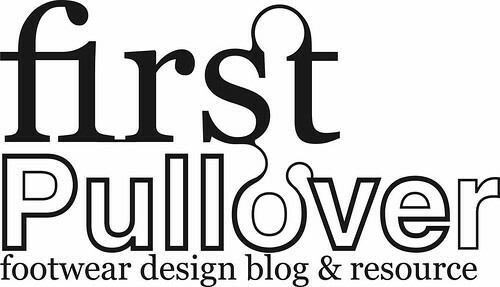 This process is then repeated for the heel area. The sides of the upper are usually lasted by hand. 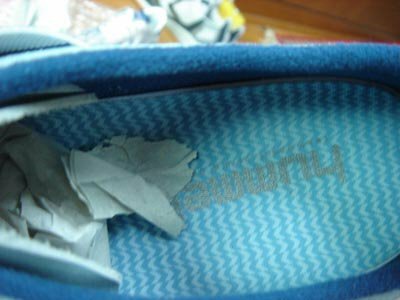 In this way, a lasting worked uses a pair of plyers and a hammer to pull the upper material near the waist (arch) of the shoe tight, and hammer them flat to the cardboard insole board. Lasting this area by hand is good so that the operator can make small manual adjustments to how much is the upper is pulled to create a good fit tight on the last. 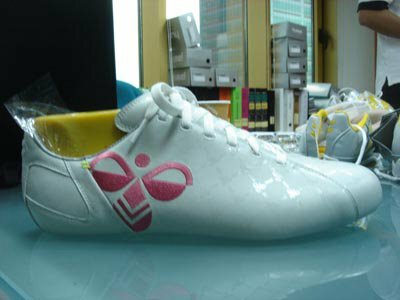 As leather materials are often used for fotoball shoes that have some variability in the amount of stretch this manual lasting can compensate unlike a machine lasting procedure that pulls the same amount every time. More good stuff that never saw the light of day. more pics after the Read More link below.